As our health care institutions have transitioned to EMR’s, the collection of data has grown exponentially. Health care professionals should be empowered to leverage that data to and enhance the quality of care. The opportunity to provide better care to the population, however, is met with the struggle of deriving meaning from the data. Our team has approached this problem by reimaging the way clinicians provide care for populations. Rather than starting at the individual patient level, we start at the highest level of a population and then allow the clinician a way to ‘zoom-in’ to the areas of concern. By reviewing the population and subgroups (registries) first, the clinician can understand the health of more and take action on that whole group of people instead of patient by patient. We are able to summarize the health of the population by establishing health measures. If a member of the population has diabetes, for instance, they will be assessed based on if they miss or meet the expected outcome of the health measure (e.g. did they get their annual foot exam). 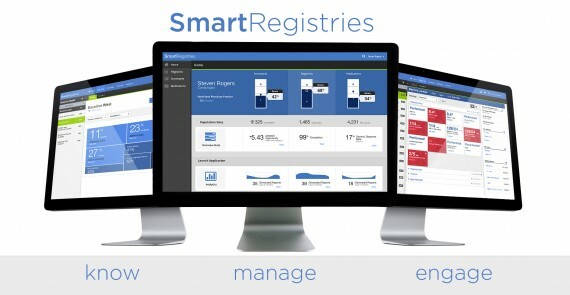 The registries help a clinician make the smart decisions when it comes to caring for their population. Clinicians and supporting hospital administrators were shadowed and questioned onsite to explore how they assess the health of their population and adjust the care accordingly. The UX team of designers and researchers conducted 6 rounds of user testing, 36 usability sessions, 10 prototypes, 29 test subjects, to date. We also continue to shadow and test as the solution has been implemented. Our alpha client helps manage 1,200 clinics, 11 PHO’s, and 4,000 clinicians, which care for over 500,000 members of the Illinois population. Nurses will leverage Smart Registries to help assess the health of an individual member of the population and contact them to come in for follow-up visits. Office staff members will track the care the clinician’s are providing and adjust logistics based on trends in provider’s performance on hospital measures (e.g. required training). Clinicians track how well their population is performing on the health measures by assessing the registry performance. If a registry (e.g. Diabetes) is performing poorly, the provider can investigate what health measure(s) (e.g. foot exams) are causing it and outreach to those patients with educational material or encourage follow-up exams. Providers may also adjust treatment for that registry to increase the health of those members. The delivery of this product is still in its infancy. However, a recent visit to the 25 office administrators that oversee all 4,000 providers and hospitals confirmed the solution is powerful and delightful to explore. Being able to assess all of the registry information so easily surprises end users. Assessing the health measures for an individual member is fast. The interface calls attention when action should be taken. 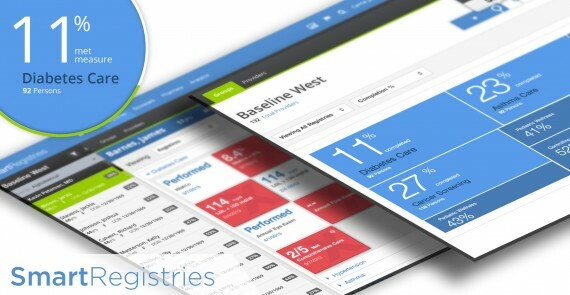 It displays the information consistently between providers, office admins, and analysts so everyone can navigate the solution the same despite how much access they have within the solution. Providers can also compare their quality of care to other similar physicians. The subtle indicators can be a motivator to explore new treatment techniques or management of care and in-turn cut costs. Whether it is the analysis of the registries or the distribution of generic vs. name brand medications, the solution enables quick assessment of complex data and the ability to take action or inform future care decisions. Designers began the project by shadowing end-users to investigating current workflows. By understanding the current workflows of tracking the health of populations, we were able to begin iterating on future workflows that accommodated current needs and explored future capabilities. The user base is well established in the desktop environment but the designs take a responsive approach to accommodate tablet-sized devices as well. The solution can change shape and layout in a fluid manner. For a consistent experience throughout the application, the design team worked hard at establishing consistent components (both visually and code base) through a dynamic styleguide so the application is can easily adapt. We have been able to confirm our approach to workflows and data visualizations through user testing and adjust our designs to ensure clarity. We’ve also uncovered that trying to assess the health of a population and the care clinicians are providing becomes extremely cumbersome at these scales. Everything designed is based on the goal of efficient assessment. Whether provider’s registry performance to expose areas of improvement or reviewing members’ health, we designed the experience to be enjoyable. The software does all the difficult processing, so the user can focus assessing the patterns and taking action.